Maria Snyder unveiled the cover for her upcoming novel, Outside In, the follow up to Inside Out in her latest newsletter. For more cover goodness, check out: Babbling About Books, All Things Urban Fantasy, Paperback Dolls, SciFi Guy, Lurv a la Mode and Tez Says. Ilona Andrews has posted a fabulous snippet from Magic Slays. Jackie U is talking about those first novels that Popped Our Paranormal Cherry over at Bitten by Books in the latest edition of Off the Fang. I totally can’t believe I missed this. 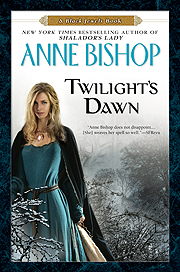 Anne Bishop has another Black Jewels novel coming out. This time, Twilight’s Dawn, will feature four novellas featuring our favorite characters. Twilight’s Dawn is set to be released March 2011. The latest short story being featured by Fifty-Two Stories is The Loveliest Children by Kathleen Foster. Jess Haines is looking for book bloggers to review the second Others novel, Taken by the Others, which is due out in January 2011. Something I missed out on this time around is the fabulous tradition of quotes over at the Frost Forum. If you’re not familiar with Jeaniene Frost’s forum, a few members always seems to get their hands on an ARC of the latest release and teaser snippets are always posted a month or so leading up to a release. Jeaniene has a few favorites posted and now I want to read Eternal Kiss of Darkness even more. SciFiGuy is giving away a copy of Julie Kagawa’s The Iron King. Contest ends Aug. 3rd. Moira Rogers is giving away a few signed books by Ann Aguirre. Contest ends at some point in the future. All Things Urban Fantasy is giving away 5 copies of Trent Jamieson’s Death Most Definite. Contest ends July 29th. Marta Acosta is giving away two copies of Happy Hour at Casa Dracula. Contest ends July 29th. whoa, amazing cover! Can’t wait for this!